Interested in private lessons? 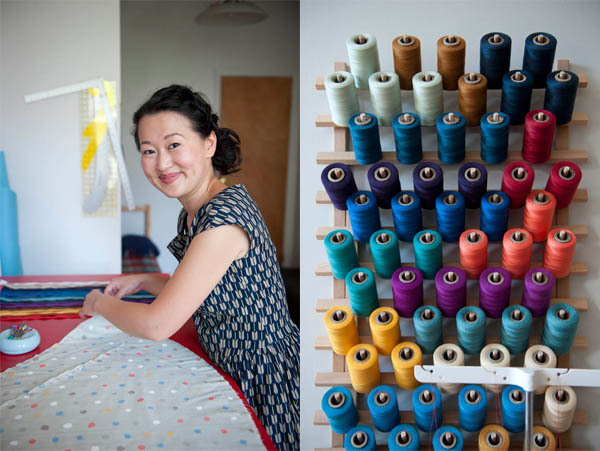 Jamie Lau Designs offers individualized sewing lessons for both adults and children. Contact us at jamielaudesigns (at) gmail (dot) com for more information and to schedule an appointment. Stay tuned for new class dates! Sashiko is a Japanese embroidery technique that can be traced back as far as 17th century Japan. In this workshop, students will learn this running stitch technique and create a sampler using the seigaiha (or wave) pattern. Sashiko embroidery is a great way to embellish your clothing and accessories. After the class, students are encouraged to incorporate their samplers into sewing projects such as tote bags, quilting, or clothing patches. Join us for a 2-hour interactive workshop on fashion design. This inspirational and creative fashion design course will introduce you to the principles of fashion design, including basic fashion drawing techniques, creating mood boards for color selection, and fabric awareness. Students will have access to croquis (fashion figure templates), colored pencils, and markers for sketching. In addition, students will also create inspirational mood boards using magazine tears, fabric swatches, and collage. This course is open to students, aspiring fashion designers, stylists, fashionistas, and seamstresses alike. In this 3-hour workshop, students will learn the essential skills of sewing: how to use a sewing machine, basic pattern reading, and sewing construction while creating a simple, reversible tote bag. The materials fee includes solid exterior canvas material and webbing for bag straps. Studio has machines for student use. In this two-day (10-hour) sewing workshop, students will learn how to sew our signature Midi Dress pattern, exclusively available through our workshops. We will discuss basic pattern reading, taking measurements, and fabric layout best practices. Garment construction technique demonstrations include applying neckline bias binding, sewing gathers, hemming, how to use a serger, and achieving a professional finish. Students will learn how to sew a relaxed summer top using our Trapezoid Top pattern, available exclusively through our workshops and not sold in stores or online. The top features relaxed fit kimono sleeves and slips on effortlessly without the hassle of a zipper or button closure. This easy-to-wear silhouette is layerable for year-round wear and the perfect project to jumpstart building your handmade wardrobe. We will discuss basic pattern reading, taking measurements, and fabric layout best practices. Garment construction technique demonstrations include applying neckline bias binding, sewing curves, hemming, and achieving a professional finish.